Plasma Freezer provides an ideal freezing environment for the preservation of Plasma Bags and test samples. 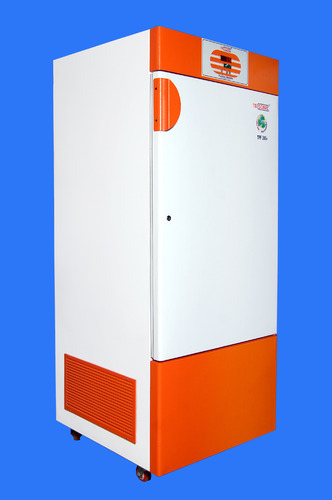 This unit designed to maintain a stable and uniform temperature of upto -35°C (-40°C in AC Room). Available in both Vertical and Horizontal model with four different sizes. The user friendly design includes a built in stainless steel insulated inner door, and simple calibration is possible via the control panel. This coupled with a visual and audible alarm system, ensure that your samples are both safe and secure. Free PUF (Poly Urethane Foam) Insulation to ensure CFC temperature stability and save power consumption. Presenting an unparalleled gamut of precision-engineered Medical Equipment, established in the year 2004, Jeshra Instruments Pvt. Ltd. are responsible and responsive Manufacturer, Exporter and Supplier of Blood Bank Equipments, Pharmaceutical Equipments, Central Monitoring System, Cryoprecipitate Bath, Refrigerated Centrifuges, Micro Controlled Blood Bank Scale, Cryoprecipitate Freezer, Platelet Agitator, Blood Bag Tube Sealer, Tecsonic Blood Bag Tube Sealer, Micro Controlled Based Dual Pan and Data Logger Central Monitoring System. Our company is ISO 9001: 2008, 13485:2003, CE Certified, as we stringently following internationally accepted quality standards. Since we are dedicated towards providing high-performance and reliable products; we have done interaction with experts, careful study and thorough research. In addition, to meet bulk requirements and make timely delivery; we have developed an efficient make-to-order manufacturing process. Blue Color is also available of Machines.